The Knitting Pirate » In Which the Pirate Starts a Mystery Project. « In Which the Pirate Makes a Difficult Decision. In Which the Pirate Starts a Mystery Project. Now that the Fleeps are done, it's time to move on to the next gift, which is something for Janis's little Stardemon. Unfortunately for blogging purposes, this is going to be a Sekrit Surprise Gift, and that's going to make writing about it a little difficult. 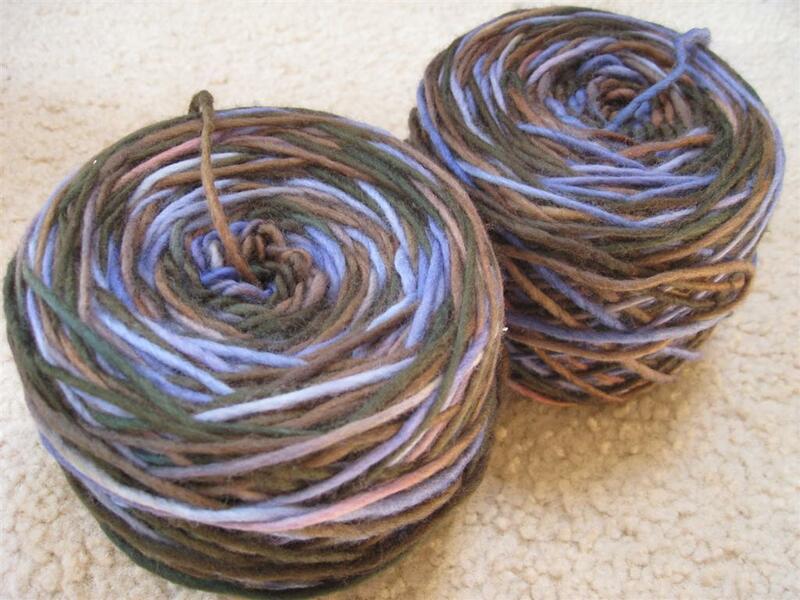 But there are a few things I can say: I'm using this worsted-weight merino from 100purewool. It's the "Winter Joy" colourway and it is so, so very soft. I wound it up on Sunday afternoon into these beautiful cakes, with only a little bit of grumbling as the yarn had gotten a little felted together in places, and then I started knitting. It is as wonderful to work with as I remember, and just as soft. Before bed, I'd knit enough to feel like I got a really good start on the project, and I put it down with a sense of accomplishment (and aching hands). I added a few more rows on Monday. I don't want to ruin the surprise, so I might not say much about this project until after it's done and given. I'll leave it with this for now: wow, my tension is even. The stitches look so pretty. The yarn is delightfully soft, and knitting up to a good firm gauge that is neither too drapey nor too stiff. I found a knot in the yarn and after a little growling at it, I cut around the knot and spit-spliced the ends, and now I can't see where the join is. And even though this yarn obviously felts with very little effort, I don't feel at all worried about giving a handwash-only sweater to my knittingest friend. This entry was posted on Tuesday, November 30th, 2010 at 09:00 and is filed under babyclothes, BSJ2, gifts. You can follow any responses to this entry through the RSS 2.0 feed. Both comments and pings are currently closed. Aw, I love the colors! Perfect for Stardemon. :) I hope you enjoy the rest of the knitting!